automatically watering areas in the garden based on the moisture readings. I say first attempt, because as I finish up this attempt I can see several areas where improvements can be made. I mean, whoa. 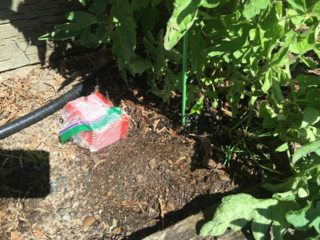 I had no idea what the difference between measurements using two galvanized nails versus a sensor used by horticultural researchers….and if the idea is only for watering my backyard vegetables and not a cash crop – how much do I care? So…what is the best my auto watering solution needs to be? build a moisture sensor gizmo that collects info on the moisture of the dirt it is stuck in and sends it to a receiver hooked up to my Mac. build a receiver that reads the info sent by the moisture sensor gizmo and displays the info on my Mac. identify improvements for the second prototype. Felix Rusu (lowpowerlab.com) for his work on the Moteino. The Moteino is an open hardware Arduino + RFM69HW radio development board very similar in concept to Adafruit’s Feather series. In fact, it is Felix’s RFM69xx library that Adafruit – and hence most of us – use within the Arduino IDE to talked with the radio. Thanks to Adafruit for great development board products like the Feather series. Adafruit’s support is excellent. I had a challenge with using a serial port with the feather (see below). Thanks to Mike in Adafruit support, not only was my issue quickly fixed, but I learned stuff about the micro controller used by the Feather that I hadn’t realized. THANK YOU MIKE. I also want to thank Tony DiCola for removing any complexity in using the Watchdog timer by writing Adafruit’s Sleepy Dog library. THANK YOU TONY. The Arduino and Fusion 360 files are available at this GitHub location. The moisture sensor has three clearly marked pins, one for GND, VCC, and data. The instructions consist of a sentence on the eBay page: Output voltage :0-2.3 V [2.3V is completely immersed in water] voltage, 5V power supply, humidity, the greater the output voltage increases. 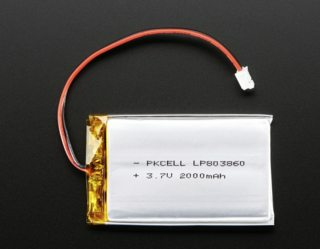 A Lithium Ion Battery. I don’t have active electrical plugs within reach of all areas of our backyard. This leads me to choosing either solar or battery power. I felt using a battery would be the simplest solution. I wanted to recharge rather than replace the battery and I wanted the battery to power the remote measuring sensor for as long as possible. For these reasons, I chose a lithium ion battery. POSSIBLE SECOND PROTOTYPE IMPROVEMENT: Determine if solar power will work “better” if it does, replace battery power with solar power. Adafruit’s Feather 32u4 with RFM69HCW: YIPPEE! for this development board. It dramatically speeds up how much time it takes to complete this prototype. 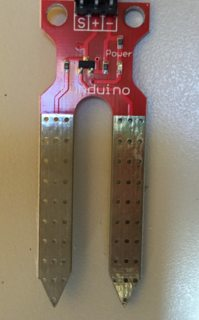 Besides having a small and light form factor, it is compatible with the Arduino IDE and Arduino’s pin outs. It integrates in the terrific RFM69HCW radio that I have played with before – a great solution for home automation tasks that are not suitable for bluetooth or wifi. A battery connector supports me plugging in a LiPo Battery and there is a micro usb port for communicating with the Arduino IDE. If that wasn’t enough – like all the other Adafruit development boards – there are a wealth of libraries and documentation. Add Adafruit’s excellent support, and the price is a bargain over what I’d have to do to bumble my way through putting the chips together. Perhaps if I get serious about a final future build I might think it worthwhile to design my own PCB. But for prototyping? Like I said – YIPPEE!!!!! Have a realistic model for each component. By realistic, I mean not just the dimension of the object in the physical space, but also any room needed for placement on the side or cables, which is the case for the LiPo battery. The simple models I made were based on measurements I made with my caliper. When I relied on parameters I measured without a realistic model, I ended up having to reprint/adjust much more often. I found the Fusion 360 model for the Feather here. Given the enclosure is going to be placed outdoors within an irrigation system, minimize any openings. Now, this sounds obvious. Yet my original design had an opening for the micro-USB port. I ended up with two slits for the moisture sensor. Hmmm… come to think of it, including the moisture probe inside the box is not the best idea. Much better would be to have small holes for about 22 AWG wire that goes between the enclosure and the moisture probe. POSSIBLE SECOND PROTOTYPE IMPROVEMENT: Move the probe to outside the enclosure. This way, the moisture sensor can be as close to where measuring takes place. Whereas the box containing the feather and battery can be placed at a close by location. Notice in the third picture on the right of the enclosure pictures that I ended up placing the enclosure into a ziplock bag and taped it up with waterproof tape. 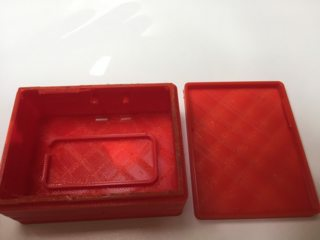 I also put silicone around the area where the prongs went through the slits within the enclosure. Adafruit’s Feather 32u4 with RFM69HCW attached via USB to my Mac. Arduino IDE with the monitor displaying moisture readings on my Mac. Manually restarting the boot loader is one of the behavioral differences discussed in Adafruit’s documentation . That will make the code wait until the USB registration has finished before trying to print anything. This race condition is noted in the if(Serial) Arduino documentation. Looking back, I should have looked into why the examples that used the Serial functions started in setup() with while (!Serial); instead of deleting because I didn’t have an understanding why it was there. A D’OH moment on my part. Firmware Version: This is currently set to 1. The value of the Firmware Version is used by the Receiving Station to figure out if it understands the valueStruct_t structure. Moisture Reading: This is the reading from the moisture sensor read from one of the Feather’s ADC ports. Sleep (in milliseconds): The amount of time between readings. RSSI: To get an idea how how strong the signal is between the TX box and the Receiving Station. The Node ID: In order for a Receiver to know which RFM69* radio sent a packet, a Node ID is sent with the data packet. In the Receiving Station’s Arduino sketch, the Node ID is set using #define NODEID 2. In the evolved experience where there are three or more TX boxes, the Receiver will need to know which TX box sent the packet in order to identify where to irrigate. Minimizing the amount of power used by the Feather. Minimizing the power used by the RFM69CHW radio when sending data packets. Minimizing the number of data packets that are sent. Leave it to Adafruit’s document and SleepyDog library to make it easy for me to minimize the power the micro controller gobbles up. Instead of using delay(), the SleepyDog library uses the watchdog timer. Adafruit’s Feather documentation under Radio Power Drawdoes a great job showing how power use is minimized using the watchdog timer. // Since the watchdog timer maxes out at 8 seconds…. int number_of_sleeper_loops = 4; //time between taking a reading is 4 * 8 seconds = 32 seconds. The watchdog timer’s max amount of sleep time is 8 seconds. If you set the time between readings to be >8000 and <= 32767 (the maximum positive value for an int), the watchdog timer is set to 8 seconds. If you set the time between readings to be >8000 and <= 32767 (the maximum positive value for an int), the watchdog timer is set to 8 seconds. A negative signed int will set the watchdog timer to 15ms. When transmitting the packet within the transmitReadings() function, I make a call to radio.sleep(). where the number (in this case 31) sets the amount of power used for transmission between 5 and 20 dBm. The value for the power level can be from 0 – 31. The amount of power increments in steps of 1 dBM. So for example radio.setPowerLevel(1) = 6 dBm. If that is the case, I was wondering why values go from 0 – 31 instead of 0 – 15 since radio.setPowerLevel(15) = 20 dBm. I tried a variety of tests where the radio of the TX box was set at a variety of power levels and determined given the distance, I needed to leave the power level at the highest setting. For this prototype, the only thing I am doing to limit the number of data packets sent is to send at a period of 32 seconds (instead – for example – every time through the loop() ). POSSIBLE SECOND PROTOTYPE IMPROVEMENT: Send a packet only upon request of the Receiving Station. 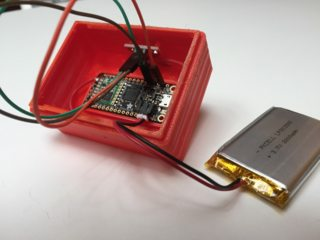 There is no point to sending packets unless the TX box is asked for an update since the intent is to take action and water (or not) depending on the moisture sensor reading(s). A moisture reading in the 500’s means the soil does not need watering. But more on making a decision based on readings in the next post. Explore the benefit of a more accurate/reliable sensor. Determine if solar power will work “better” if it does, replace battery power with solar power. Move the probe to outside the enclosure. Send a packet only upon request of the Receiving Station. Thanks for reading this far. Please find many things to smile about.